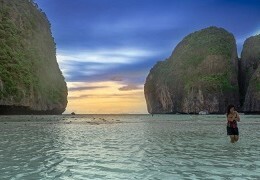 It’s only in Thailand, and only if you wish to stay here for longer than just a couple of months at a time, that being older than 50 is an advantage – at least when it comes to obtaining a proper long-stay visa. Unfortunately your webmaster, at the tender age of 42, hasn’t arrived in that league yet. Despite having a long-time Thai GF who has shared the last 16 years of his life, he was never keen on getting married either which, visa-wise, was a very dumb decision. No chance of permanent residency, not even the remotest possibility of a legally obtained one-year visa for me. Instead it’s time for yet another visa run to Laos again where I’ll apply (hopefully successfully) for yet another double-entry tourist visa. If things work out as planned the procedure should be as follows: Following a lengthy journey to Vientiane starting from Pattaya Tuesday afternoon (some details of which I will cover in this post) I will apply for a fresh double-entry tourist visa (2,000 Baht fee) in Vientiane Wednesday morning. Provided I get there in time and the consulate isn’t closed for applications by the time I get there, a one-night stay in Vientiane (one of the least happening cities in Southeast Asia, probably only second next to Savannakhet) should be enough and I get my passport, including a fresh Thai visa sticker, back Thursday afternoon. Upon arrival back in Thailand I should then receive a permission of stay for initially 60 days (first entry) + 30 days (first extension at the local immigration office at a fee of 1,900 Baht) + another 60 days (second entry via a one-day border run to Cambodia) + another 30 day extension. That’s almost half a year in total, including one border run and two visits to the immigration office. 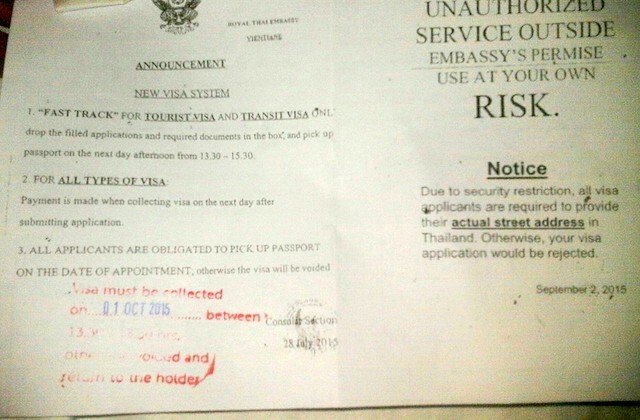 Fortunately, there is still no official limit to the number of back-to-back tourist visa you may apply for; that is provided you meet the official requirements which may change from time to time. 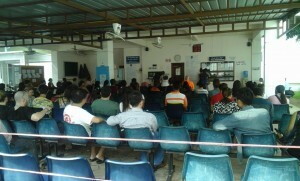 The only limit there may be is that individual Thai consulates (such as the one in Vientiane, for example) restrict tourist visa applicants to a maximum of three back-to-back applications, after which they may put a red stamp in your passport telling you not to apply for another visa there next time. If this should ever happen to you you’re obviously still free to apply for another tourist visa at another Thai consulate in the region. But to prevent the possible risk of an ugly red stamp defacing the pages of your passport we feel that visiting a different consulate from time to time, in another city or another country, may be a good advice for tourist visa long-stayers. In your webmaster’s case: After nearly five years on an education visa I completed two visa runs to Savannakhet, also in Laos, in October last year and another one this April. So for a change, I’ve picked Vientiane as my next destination – which trip also gives me the opportunity to update our popular visa run to Vientiane pages (it’s actually four separate extensive pages) which i didn’t get to do since my last visit there in February 2010. As most important stuff you need to know about a trip to Vientiane has already been covered there, this post will focus on things that have changed over the last five years and will be less detailed than our Savannakhet trip report from April 2015. 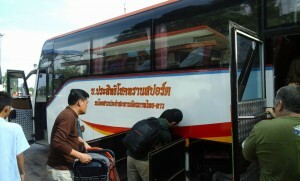 The easiest and fastest way to get from Pattaya to Vientiane is obviously by air. 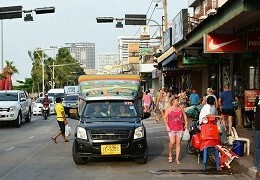 Direct flights to Vientiane are however quite expensive so most people will opt for a budget flight to Udon Thani (there are frequent daily connections from Bangkok) and then catch a minivan to the border. Or you can take a direct bus from Pattaya to Nongkhai, the little Thai border town just across the river from Vientiane. But your webmaster must concede that he doesn’t particularly like flying and will avoid it at all costs if there’s an alternative means of transport. And well, I do have a number of justified safety concerns when it comes to traveling by bus in Thailand, especially overnight. I have therefore opted to travel by train (I’ve done this trip half a dozen of times in the past) which implies a relatively long but also relatively comfortable and safe journey. Here’s my itinerary. 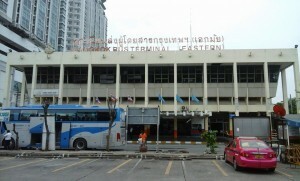 To start with, I will catch an afternoon bus from the bus terminal in North Pattaya to Bangkok’s Ekamai station in a couple of hours. The fare should be around 120 Baht and the ride not take longer than two hours I hope. From Ekamai I’ll take a skytrain (BTS) to Asoke station which connects directly (just follow the exit signs) to the MRT Sukhumvit station. From there I’ll take a subway to Bangkok’s main railway station, Hua Lamphong. The skytrain/subway trip from Ekamai to Hua Lamphong shouldn’t take longer than 30 minutes and cost something like 60 Baht in total. My “express” train leaves from Hua Lamphong at 8 p.m. and is scheduled to arrive in Nongkhai (the railway station there is just a two-minute tuktuk drive from the Thai-Lao border checkpoint) at 6.45 a.m. I’ve booked a lower berth in an air-conditioned carriage (758 Baht one-way) so should be able to get a bit of sleep as well. If I’m lucky and it’s not too busy at the border I should be at the Thai consulate in Vientiane in time to apply for a fresh visa. Note: If you want to make sure you get your preferred seat/berth on the train (the 8 p.m. express train is your best choice) advance booking is highly recommended. 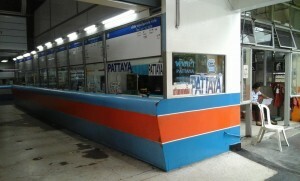 In Pattaya, you can book train tickets at the small railway station off Soi Siam Country Club in East Pattaya. I booked my seat three days in advance and surprisingly had to produce my passport number. My plan is to stay just one night in Vientiane (there isn’t much to do in that sleepy town), pick up my passport with a new visa the following day and immediately cross the border back into Thailand. 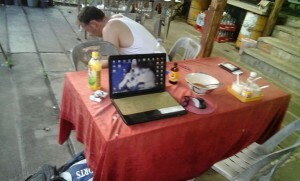 If I’m too tired to travel straight back to Pattaya I might stop one more night in Nongkhai or Udon Thani? I’ve used Agoda to book a cheap hotel room with Wi-Fi connection (that’s what the room description promises) near the Mekhong riverfront in Vientiane. That’s the main tourist drag so-to-say in Vientiane and has a couple of restaurants and bars (no, it’s nothing but really nothing like Pattaya. Alright, it’s time to pack my bags! I caught the 4.30 p.m. aircon bus from the Roong Reuang bus terminal on North Pattaya Road (fare 115 Baht this time) and expected to arrive at Bangkok’s Ekamai terminal two hours later or so. But due to heavy rainfall just before Bangkok and a traffic jam on the motorway and also on Sukhumvit Road, I would have surely missed my train if I hadn’t gotten off at the Tesco Lotos branch in On Nut, which is one stop before Ekamai terminal and just below the first skytrain station (On Nut BTS station) along the way. I was lucky I could immediately catch a skytrain to Asoke station, there followed the exit signs to Sukhumvit MRT station and caught a subway to Hua Lamphong where I arrived just in time at a quarter to eight. The BTS fare from On Nut to Asok was 31 Baht, the MRT fare from Sukhumvit to Hua Lamphong was also something like 30 Baht. Once you arrive at Hua Lamphong MRT station all you have to do is follow the exit signs to the railway station where I got less than 10 minutes before my train departed. Lucky me. 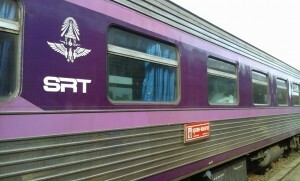 The night train to Nongkhai left as scheduled at 8 p.m.. Due to an unexpected (?) one-hour delay at the Bang Sue junction on the northern outskirts of Bangkok, however, we arrived in Nongkhai only at 8 a.m., more than an hour after the scheduled arrival time. The lower berth in the air-conditioned second-class carriage I had booked from Pattaya was comfortable and sufficiently spacious to accommodate even bigger Farangs. The aircon was much cooler than I expected, so even though you get a fresh blanket (in a sealed plastic bag) it might be a good idea to put some warmer clothes and socks on if you prefer it a few degrees warmer. Smoking is also prohibited on the train, including in the restaurant, so if you’re a smoker you’ll have to put up with occasional visits to the toilet where smoking appears to be “accepted” even by the railway staff. Funny was when one of the uniformed guys (who are actually all very friendly) asked me if I smoked. Of course I did, I replied with a sigh, and he informed me I was free to use the toilet, not without asking me for a cigarette for himself though. I laughed and he quickly disappeared for a quick fag in the second toilet on the other side of the corridor, breaking the law he was supposed to enforce just like me, lol. 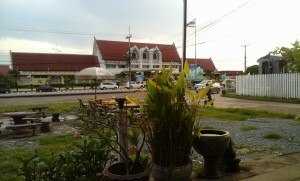 From the railway station in Nongkhai I took a shared tuktuk to the border checkpoint at Friendship Bridge. The regular fare for the three-minute ride is 30 Baht. If you prefer to walk yourself it shouldn’t take more than 10-15 minutes either. No major news here apart from the welcome fact that part of the departure area has been covered with a rooftop now. 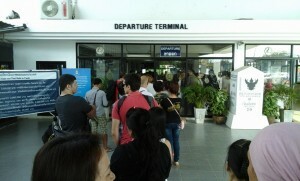 It was relatively busy but I didn’t have to wait longer than perhaps 15 minutes to stamp out of Thailand. When you’ve made it through the Thai border checkpoint you have to take a bus across Friendship Bridge and the Mekhong river (you can’t just walk across the bridge.) 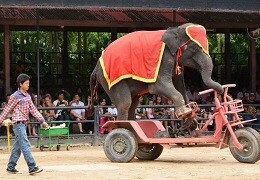 Tickets cost 15 Baht. On the other side of the border, simply fill in the visa application form for Laos and hand it over to the guy at the counter. I had to pay 1,300 Baht for the Lao visa sticker, but fees may vary depending on your nationality. If you carry US dollars you can also save a few Baht. Important: Once you receive your passport you won’t have to wait in queue anymore for your entry stamp. The Lao visa sticker comes together with an entry/arrival stamp, so you can just walk past the arrivals checkpoint and straight to the car park right behind the border where half a dozen Lao taxi/minivan drivers will most likely chat you up. From what I’ve heard they can charge as much as 400-500 Baht for a taxi ride to the Thai consulate these days so it makes sense to join some other “visa runners” who can share the cost for the approx. 30-minute ride with you. I shared a taxi with a Dutch and a Polish guy and we gave the taxi driver (he had a nice new Japanese limousine with a very powerful aircon) 120 Baht each. To start with, I had heard that Monday and Thursday are easily the busiest days at the Thai consulate, so I deliberately planned my trip so that I arrived there on a Wednesday which I assumed would be less busier. I was right. When I entered the consulate compound I was pleasantly surprised to see the place nearly empty. The Polish guy who had shared the tuktuk with me had been here just three months and six months earlier and told me there were three or four different queues each time. I was surprised she didn’t even ask for the 2,000 Baht that my double-entry visa would cost me, but she just said “pay tomorrow.” Then I noted a sign on the wall saying something like “apply for visa today, pay tomorrow,” so that seems to be their latest and much appreciated policy. “That’s it?” I asked. “Yes,” she replied,” come back tomorrow.” I didn’t even spend five minutes at the consulate. 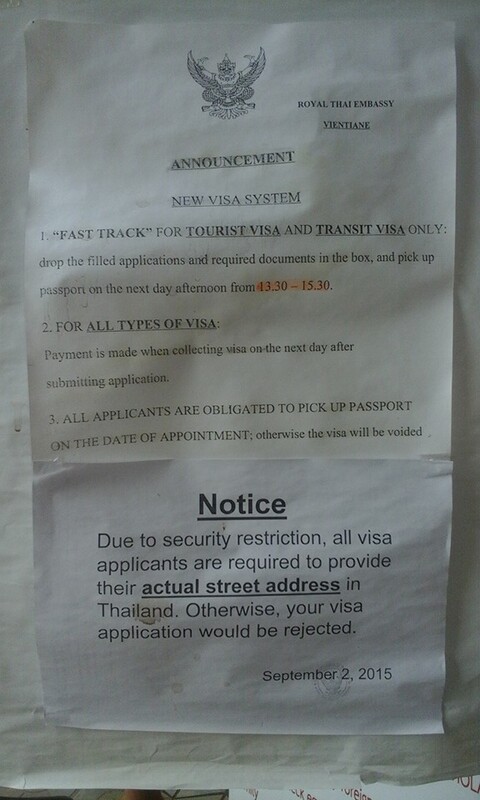 Part of the new “fast track” policy is obviously that you must pick up your passport the following day (otherwise your application will be void) and that applicants need to provide their “actual street address in Thailand”, so the name of a random hotel in a random Thai city won’t be sufficient. I simply suspect that on busier days, like Mondays or Thursdays, things will be considerably “messier” and you may be in for a lengthy wait to have your application processed. I take it I was just very lucky – or had simply picked the right day of the week for my visa run. Wednesday and presumably Tuesday seem to be the best days to apply for your visa in Vientiane; avoid the “visa run tour groups” from Bangkok and Pattaya every Monday and Thursday; and unless you plan to stay over the weekend Friday is obviously a no-no. I had booked a room with Agoda at the Vientiane Star Hotel near the Mekhong riverfront and was pleasantly surprised by my choice. The Vientiane Star is a decent and clean guesthouse with a nice little bar and restaurant in one of the small side-streets just around the corner from the riverfront (so I can easily pick up the Thai mobile signal). But not just the location is perfect, the small hotel also has a good Wi-Fi connection, at the bar as well as in the rooms, and (that’s crucial if you want to take a girl back to your room) is guest-friendly. Granted, the room is small, but that’s standard in Laos. What is unusual though for a budget hotel in Vientiane is that all the fittings in the room, air-conditioning, flat-screen TV etc. are really new. The one night I’ll be staying here cost me some 18 US dollars, and I can tell you I’ve stayed at much worse places for the same money or more in Vientiane. So if you’re on a budget and seek a basic but clean accommodation in a central location and with a reliable Wi-Fi connection, don’t look any further. And the city itself, what can I say? Over the last five years that I hadn’t been here Vientiane has gone really “upmarket” (relatively speaking), in particular the main tourist area near the Nam Phou fountain and along the Mekhong riverfront. If you have seen Vientiane 10 years ago you will know what I mean. Many of the older established small eateries and shops along the riverfront and the adjacent side-streets have either vanished or been upgraded substantially. What is more, I’ve counted over a dozen completely new and more upscale shops and restaurants (cafes, bakeries, bistros), all looking very inviting and some outright posh. Most of these new gourmet temples offer French or Mediterranean-style cuisine (pizzas, pasta, baguettes etc.) but I’ve also seen a few Indian, Japanese (Fuji) and Chinese places, even one Turkish restaurant named “Istanbul”. So if Lao street food is not for you but you’re looking for a European-style “fine dining experience”, Vientiane and its new gastro scene will pleasantly surprise you. But the biggest surprise is the immediate Mekhong riverfront area. What used to be a run-down stretch of land with just a couple of open-air Lao eateries where I would go for a beer and watch the sunset, has been developed into a well landscaped public leisure park and a huge night market with hundreds of small stalls that sell mostly Lao handicraft, souvenirs and clothes (the usual Western stuff like T-shirts and handbags, but also traditional Lao clothing). Well worth a visit in the evening. Two other observations. Vientiane is much livelier and there’s much more traffic and much more people on the roads than five years ago. Given that it’s low season and it’s not one of the main visa run days (like Monday and Thursday when dozens of “visa run tour groups” from Bangkok and Pattaya descend on Vientiane and the Thai consulate) there are also surprisingly many tourists and backpackers here. In comparison with other cities in Southeast Asia, Vientiane is certainly still relatively sleepy, but it’s definitely up-and-coming. ATMs. Vientiane now has dozens of ATMs that also accept ordinary Thai debit cards. I had read about it (ATMs were rare in Vientiane 10 years ago) and thought let me give it a try. Big mistake. The fee they charge is almost 100 Baht per transaction (I think it’s usually 20,000 Lao kip but one ATM wanted to charge me an extortionate 40k kip), so you better bring enough cash with you from Thailand. The second ATM that would charge me 40,000 kip didn’t spit any cash out either, that’s in spite of a “transaction completed” or so message on the screen. I’ll need to check when I’m back across the border in Thailand whether the money was actually withdrawn from my account or not. Bad experience. When it comes to nightlife not much has changed in Vientiane and it’s still just the same old few places where a single male would go after dark. Khop Chai Deu near the Nam Phou fountain may be worth a visit earlier in the evening; they’ve got decent food and a live music band now where the pool table used to be. 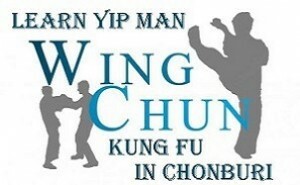 The best place to go for drinks and girls is Bor Pen Nyang on the riverfront road. It’s a huge and extremely popular rooftop bar with a big round counter in the middle, two pool tables and some TV screens. There are always a dozen or so freelancers here (girls sitting on their own at the bar or in small groups). Some may chat you up themselves (“Where do you come from?” and stuff like that) but in most cases you’ll have to make contact yourself. 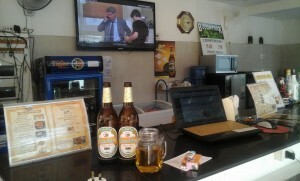 No, it’s not a bar like you may know it from Pattaya but it’s surely the best pick-up joint you can find in Vientiane. There’s also a new (at least I didn’t notice the place during my previous visits) Farang-style bar and restaurant in a side-street just around the corner from Bor Pen Nyang. It’s called Billabong Sports Bar & Grill, is managed by an Australian expat and looked relatively busy when I walked past. Yes, there are a couple of discos in Vientiane (often some weird underground places in secret locations) that keep going a couple of hours longer, but I was too tired to check them out. 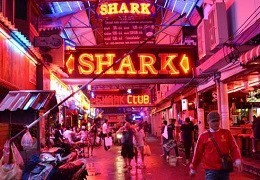 There are also many streetwalkers and a few ladyboys that roam the side-streets near the riverfront after dark. Tuk-tuk drivers that try to sell you drugs and offer to take you to places with girls are also waiting at nearly every corner. So yes, if you can’t be without “it” for a night or two there are certainly a few options but you’ll need a more “offensive approach” and be a bit more outgoing than in Pattaya. I took a tuktuk to the Thai consulate at 2 p.m. but had to wait till 3.15 p.m. until I received my passport with a new double-entry visa sticker. 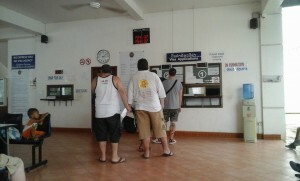 Yes, the passport pick-up procedure has also changed a bit in Vientiane. The “receipt” they give you when you apply for the visa has a number attached to it (I had no. 198). When you go to pick up your passport the next day you’ll now have to wait until they call that number or it appears on the display (you don’t have to pull an extra number); then you go to the counter, pay your visa fee (2,000 Thai Baht in my case) and you’re done. Your payment must be made in Thai Baht; they don’t accept Lao kip. It is simple but a bit more time-consuming. Pick-up time is from 1.30 p.m. to 3.30 p.m. They obviously start with no. 1, 2, 3 etc. so if you have no. 200 or an even higher number you can expect to wait until at least 3 p.m. I shared a taxi to Friendship Bridge with the same two guys as the day before (cost 100 Baht each). There were only a few people and just a couple of backpackers at both border checkpoints, so stamping out of Laos, crossing the bridge (the fare for the bus is 4,000 Lao kip or 20 Baht on the Lao side) and stamping back into Thailand took less than 30 minutes in total. My new Dutch mate and me took a tuktuk to the railway station in Nongkhai (30 Baht each) and were lucky to get the last two available lower berths (second class, air-conditioned) on the 7.10 p.m. express train to Bangkok (scheduled arrival time is 6 a.m.) The tickets cost again 758 Baht each. 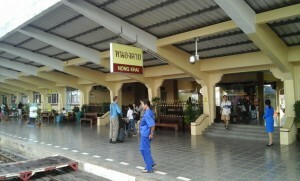 We arrived at Hua Lamphong station in Bangkok shortly after 6 a.m. I had somehow managed to sleep for most of the trip and just my bones were aching a bit. Following a quick cigarette outside the railway station we took the MRT to Sukhumvit station (28 Baht) and then caught the BTS to Ekamai (25 Baht). We arrived at the Ekamai bus terminal (it’s just below the BTS station) at 7 a.m. where my new Dutch mate (an English teacher with a degree in mathematics but in practice a professional poker player, wow) caught a minivan to Sattahip. I had to wait for another 40 minutes for the next bus to Pattaya (115 Baht again) and had a quick rice/curry meal in a restaurant just around the corner. My bus left as scheduled at 7.40 a.m. (aircon buses to Pattaya are leaving like every 30 minutes) and I was back home in Pattaya less than two hours later. To sum it up: Although Vientiane has taken some steps in a good direction in recent years and is no longer as sleepy as it used to be, it’s certainly still one of the more boring destinations in the region, especially when you travel on your own. But visa runs are a liability, not a joyride in the first place, and the main purpose is to get a new visa. From that perspective, I’ve had a smooth journey and got the visa I wanted with no problems. Mission accomplished. 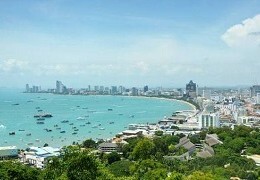 If you find a three-day trip like this too stressful, however, or you want to combine business with pleasure and make it a proper holiday from Pattaya (or your Thai wife) there’s nothing wrong with staying a couple of days longer in Vientiane or traveling around the Lao countryside a bit. If that sounds too boring, an extra one-night stop in Nongkhai or Udon Thani (which has plenty of bars and girls) might also be a good idea. Due to some obligations back home we made a last-minute decision to drop our initial plan to stop in Udon or Nongkhai for another night. 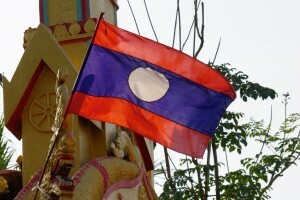 We still hope to cover that possible (fun) extension of a visa run to Laos in another six months – that’s when your webmaster has to leave his adopted country once again. Last but not least, you’re free to leave your comments re: your own experiences in Vientiane and/or at the Thai consulate there in the comments section below.